King Steel Inc.- Bensalem Pa. King Steel Inc. - Bensalem Pa. Bars, Angles, Piping, and Tubing. Hello & Welcome to King Steel Inc.
Providing information, products and services to those in and around the Bucks Country Area. Our goal at King Steel Incorporated is to supply quality metal products, at competitive pricing, and on time delivery. 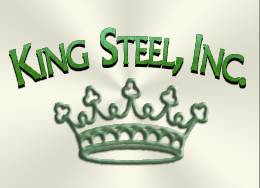 King Steel Inc., offers a wide variety of carbon steel, aluminum and stainless steel products: bar, sheet, plate, pipe, and tubing in all shapes and sizes. We also offer added services of saw cutting, shearing, flame cutting, bending, hole punching and welding. Please contact us TODAY for your Free Estimate, and allow our experienced staff members to assist you on your next metal requirement.